2010-07-11 18:26 UTC Click images for enlargements. 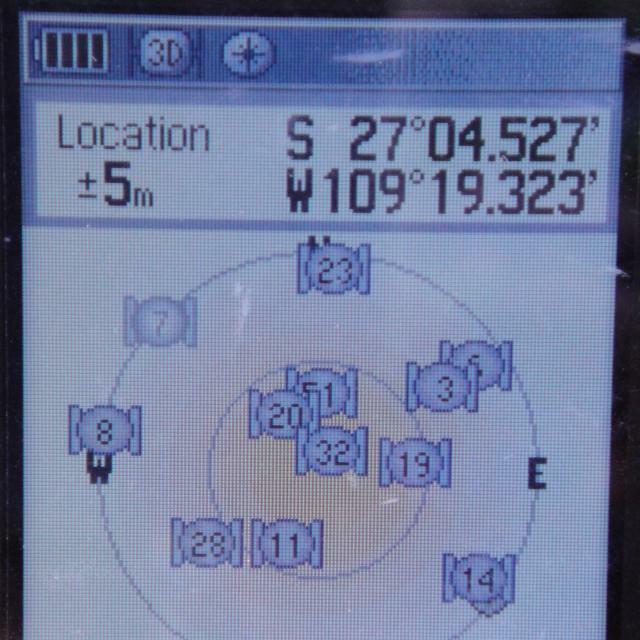 After the site survey, we selected this location to view the eclipse. 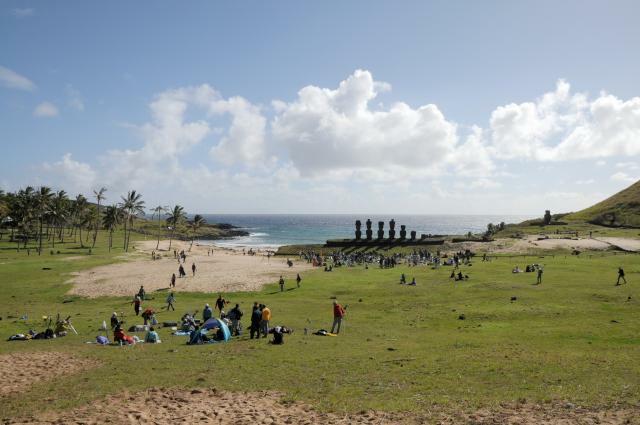 It would permit wide angle photography of totality directly above the moai, and had as good a chance as any other site on the island of clear weather. 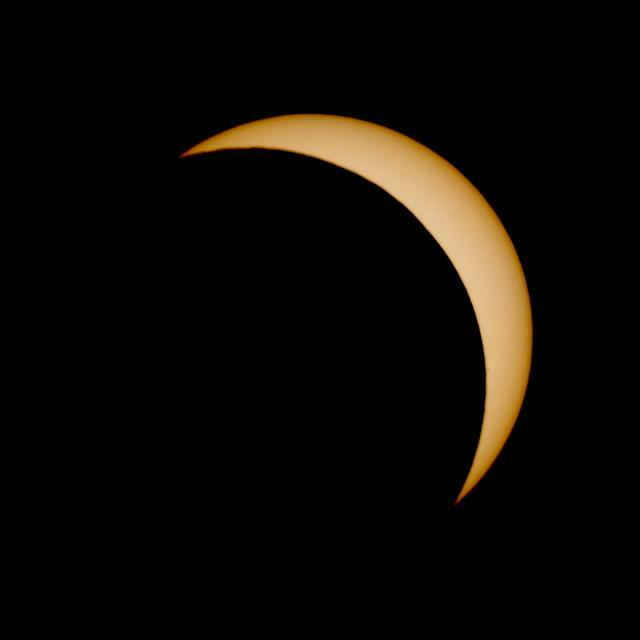 We had to shift our site a few metres to the side at the request of some seriously equipped photographers uphill of us who were recording a time-lapse sequence of the entire eclipse: glad to oblige. 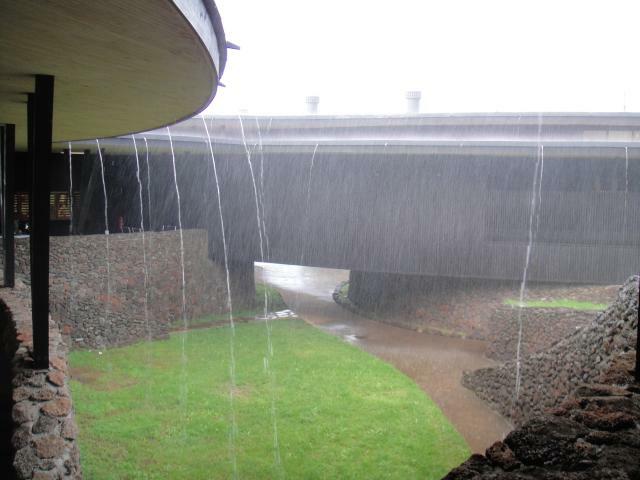 Eclipse morning dawned beautifully, but then, as Easter Island is wont to, went all “variable”, including this downpour as we were getting ready to saddle up to head for the eclipse site. But not to worry! If you don't like the weather, wait fifteen minutes! Or, in this case, shortly before we departed for the eclipse viewing site. 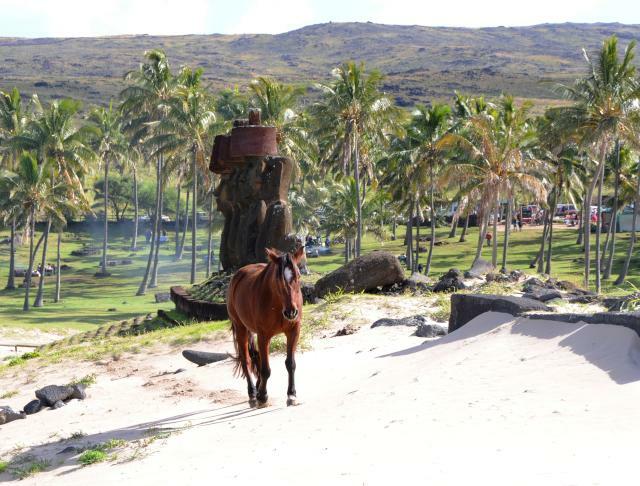 We'd carefully plotted the course of the Sun to be above the moai at totality, so we weren't worried when the Sun was behind the palm tree just before first contact. In fact, it made for a pretty nice shot. 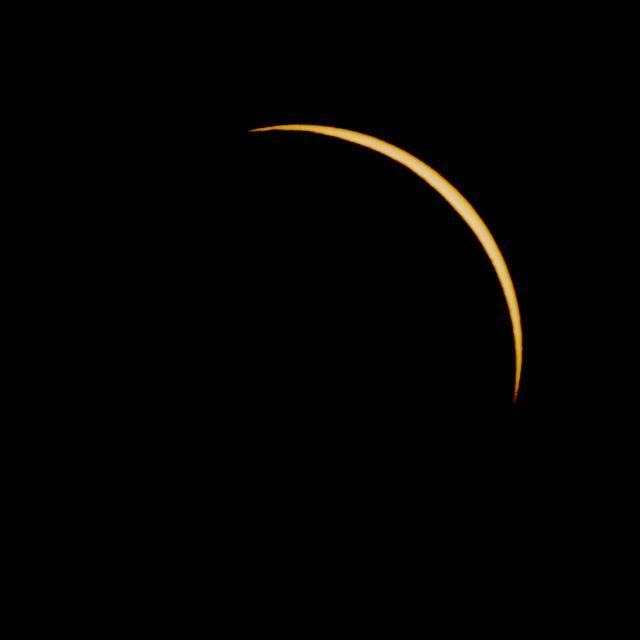 It was windy at the start of the eclipse, but the breeze abated as totality approached. Here is our Expedition Headquarters. 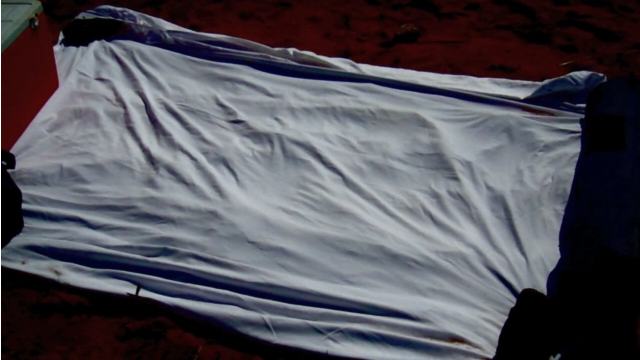 The sheet, held down by the cooler and a bag is intended to image the pulsing shadow bands should they choose to appear. 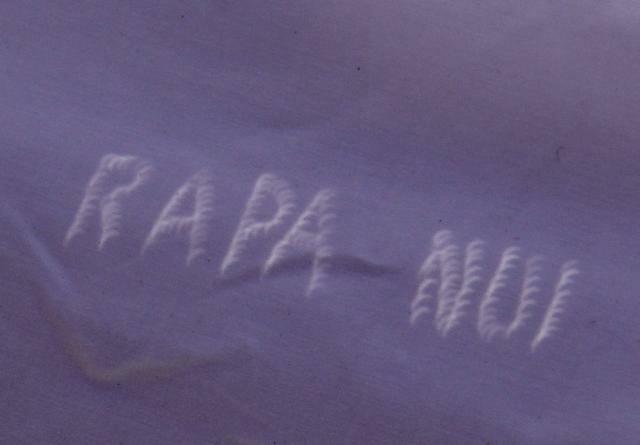 There's nothing as cool to do during the partial phase as making cool crescent images, and Judy had made a shadow mask with “Rapa Nui” poked through a card. It worked perfectly! Now we're into the partial phase. 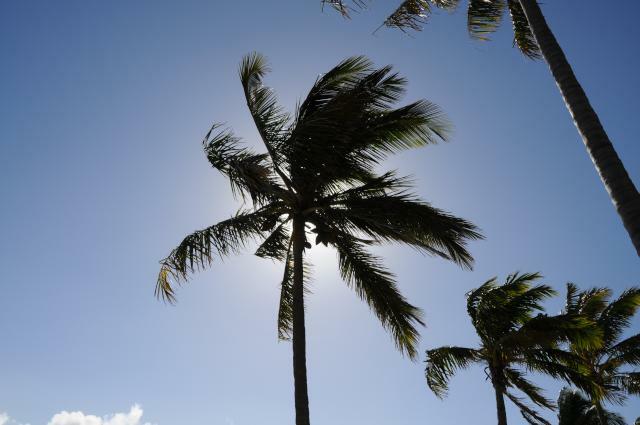 I didn't get photographs of the beginning of the eclipse because it took a bit longer for the Sun to emerge from the palm tree than I expected. Toward the lower right of the Sun's limb two sunspots are visible. 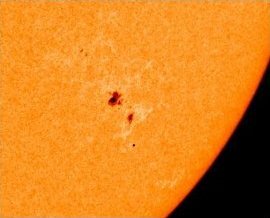 These are part of the active sunspot group 1087 which, on July 9th, unleashed a class C3 solar flare. The image at right was cropped from a full-Sun image captured by the Solar and Heliospheric Observatory's MDI Continuum instrument about an hour and a half after the eclipse. I have rotated the north-up Sun image in the clip to correspond to the apparent orientation of the Sun from our viewpoint in the southern hemisphere. All of these detailed images of the Sun were taken with a Nikon D300 digital camera and Nikkor 500 mm catadioptric “mirror lens”, which provided the equivalent of 750 mm focal length on a 24×36 mm film camera. 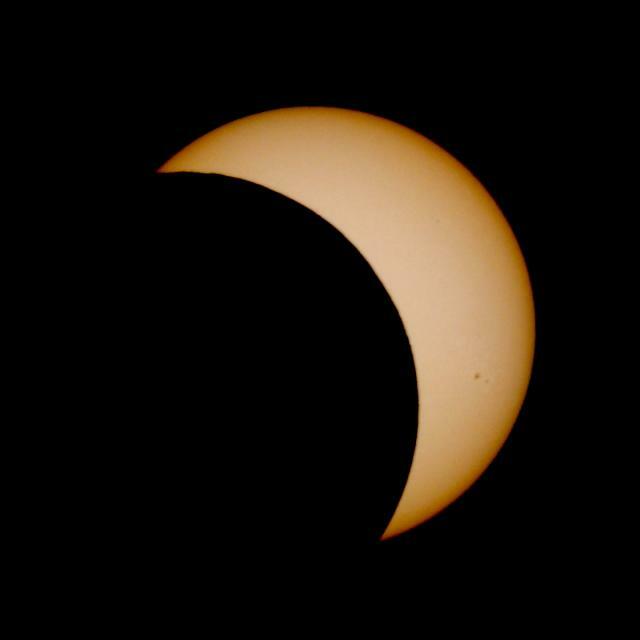 The same lens was used to photograph the 1999, 2001, and 2008 solar eclipses. Photographs during the partial phase were taken through an Orion metal on glass full-aperture solar filter placed before the mirror lens. As the sliver of exposed Sun dwindled, the pulsating shadow bands became visible on the sheet we'd laid down on the sand. When they appear (which is dependent on a variety of atmospheric conditions: we saw them in Zambia and here in Easter Island, but not a hint in Iran or the Barents Sea) they are obvious to the human eye but are notoriously difficult to capture on film or video. In the 1940s, before high speed film, some argued they would always be a visual phenomenon only. Well, look at what technology hath wrought! The following video shows the shadow bands, but they're very subtle and it helps to know what you're looking for. The bands go from upper right to lower left on the sheet, and vary in intensity. At the end of the video I've added a slow motion segment which may help pick out the pulsing of the bands. 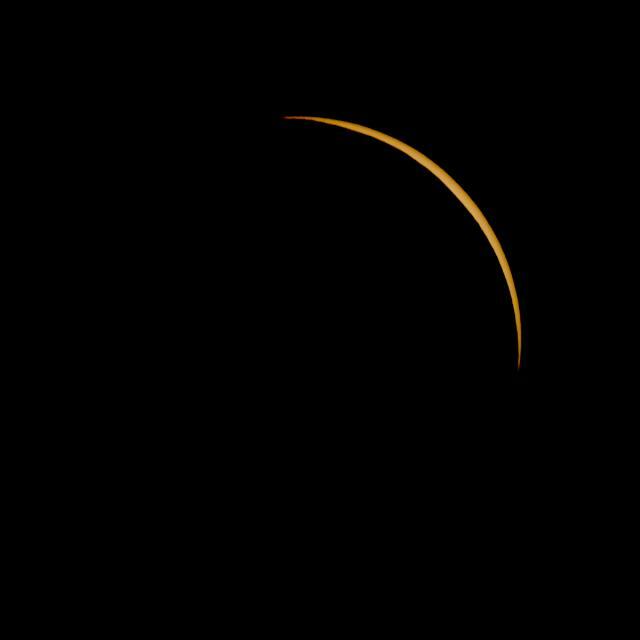 When you see them yourself, there's nothing remotely subtle about the effect, so I hope that trying to dig it out of this murky video will encourage you to go and observe an eclipse with that instrument so perfectly evolved to appreciate it: the human eye. These are big files, and depending on the speed of your Internet connection, load on the hosting site, and congestion along the way, may take a long time to download. It is, therefore, an excellent idea to save the file to your computer (with most browsers, by right-clicking the link and then choosing the appropriate menu item), then playing the local copy. That way, if you wish to play the movie several times, you needn't endure (nor burden the Internet with) a lengthy download every time. Years after this movie was made, the Web still hasn't settled on video standards that work everywhere. The formats above are listed in order of their likelihood to work on your machine, operating system, and application. 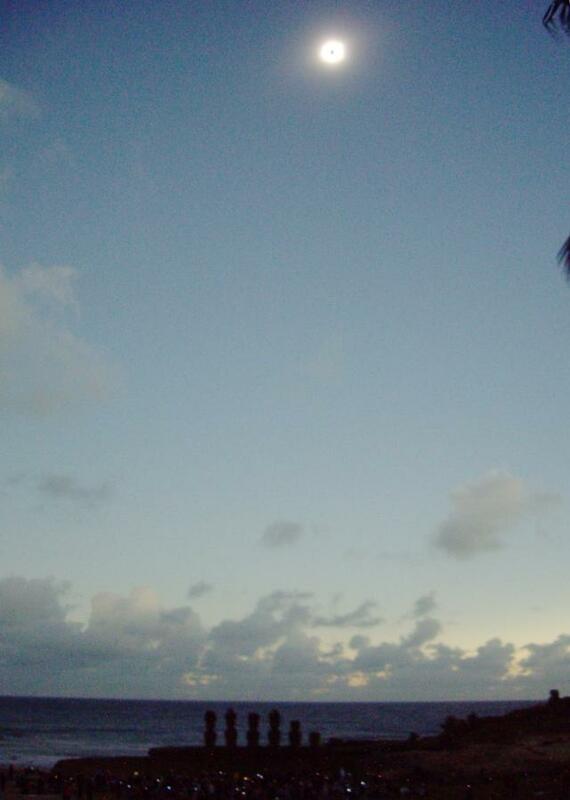 Anyway, here is the moment when the last part of the photosphere is being covered by the Moon. 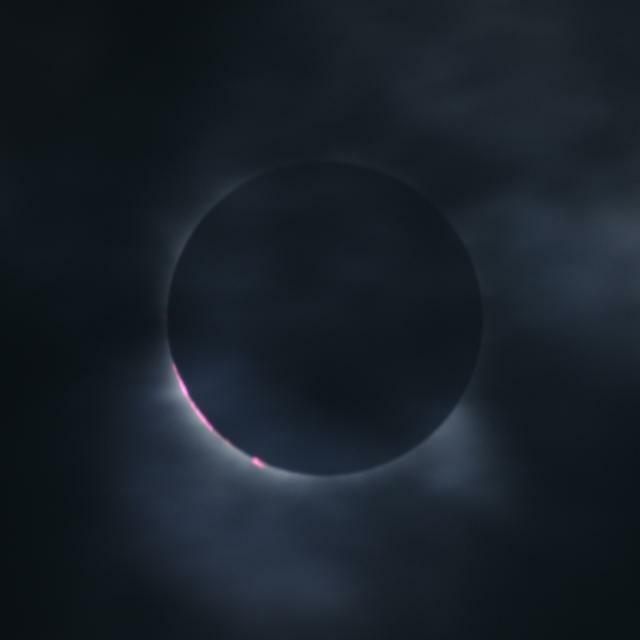 Note the hydrogen alpha red of the chromosphere and prominences along the limb of the Sun and the bead at the top of the diamond ring where the lunar profile allows a bit of the photosphere to shine through a lunar mountain valley. 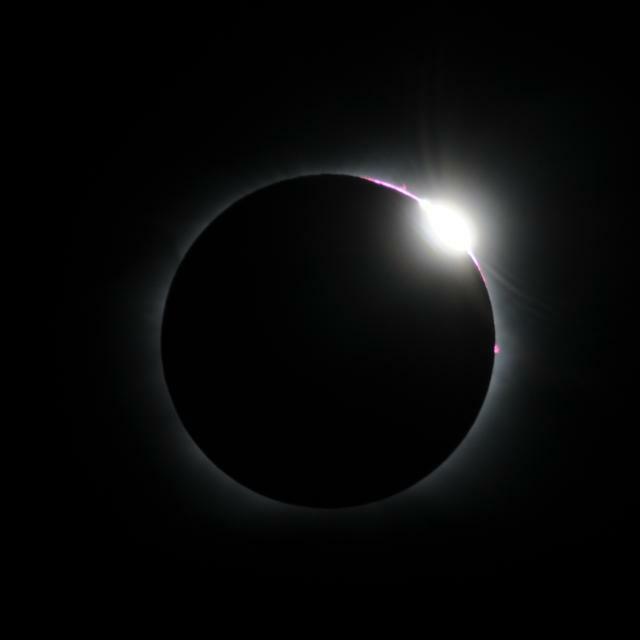 The arcs curving away from the Sun from the diamond ring are internal reflections in the mirror lens used to take this picture; they are not genuine effects. In the last instants before totality, I removed the solar filter from the mirror lens on the Nikon camera and activated my pre-programmed nine stop automatic bracketing sequence. 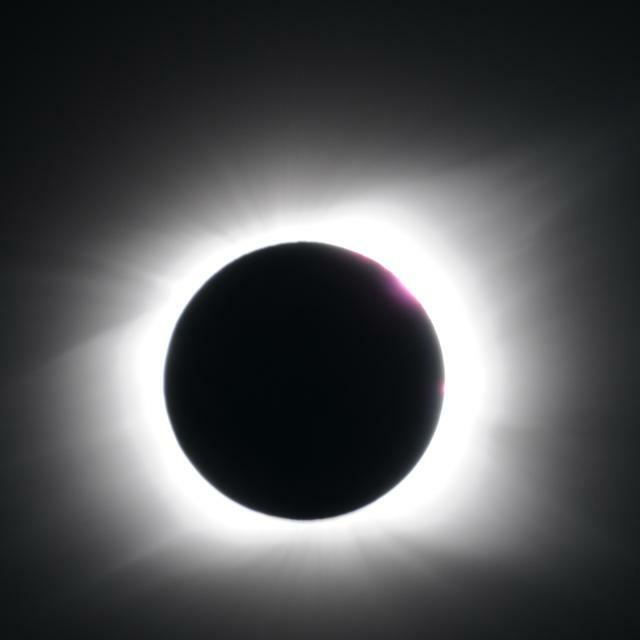 With a single press on the electronic cable release, I could take nine exposures of the eclipsed Sun ranging from a shot at 1/1000 or 1/500 second optimised for the prominences, chromosphere, and inner corona to one risking blur due to apparent motion of the Sun which would reveal outer corona streamers. 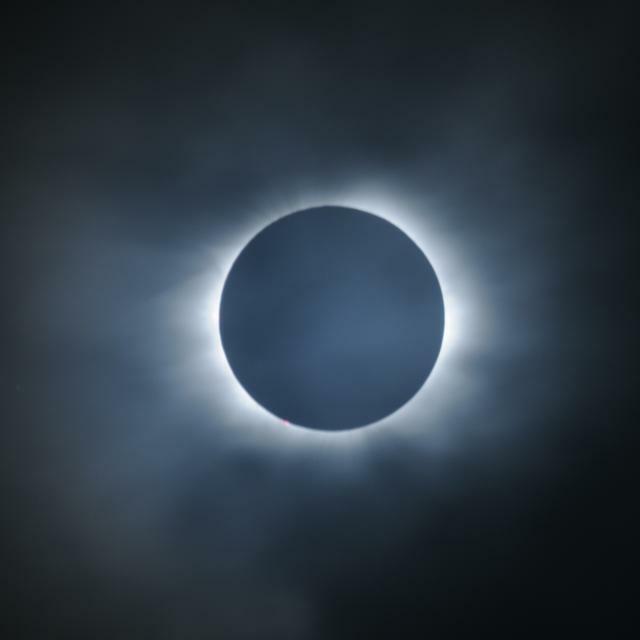 This facility in the Nikon D300 is a tremendous gift to eclipse photographers: it allows capturing almost ten times as many images during totality as with manual exposures and setting of the camera, and it allows doing so without looking away from the eclipse to fiddle with dials on the camera. 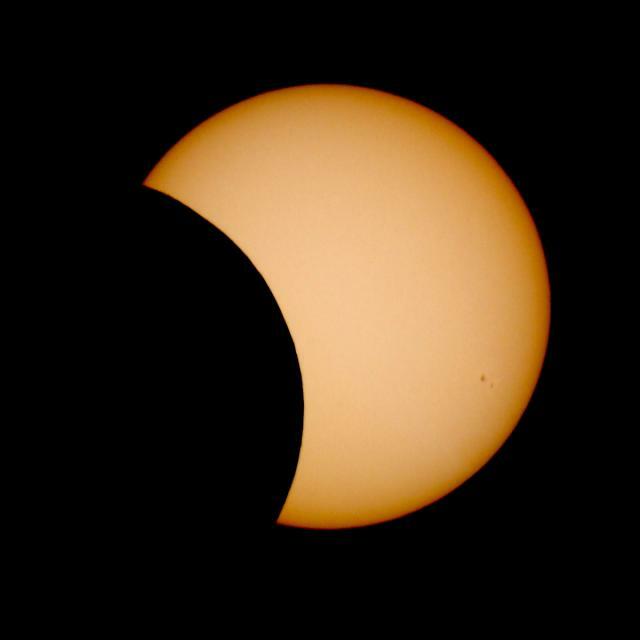 But if there are any eclipse chasers at Nikon headquarters reading this, there's one thing you got wrong, folks! There should be some way to set the shutter dial that both activates mirror-up and multiple exposure mode. As it stands, if you choose multiple exposure, you can shoot all nine bracketed images with one push of the remote release, but you're almost certain to lose some of the longer exposures to vibration due to mirror rebound. If you select mirror up mode, you have to push the release button eighteen times to complete the nine frame bracketed sequence, which defeats the entire purpose of auto-bracketing: speed. Please, Nikon, give us an item buried somewhere in the menus where we can activate a mode which will lock up the mirror, pause to let vibrations damp out, shoot the nine bracketed frames, and then let the mirror come back down. 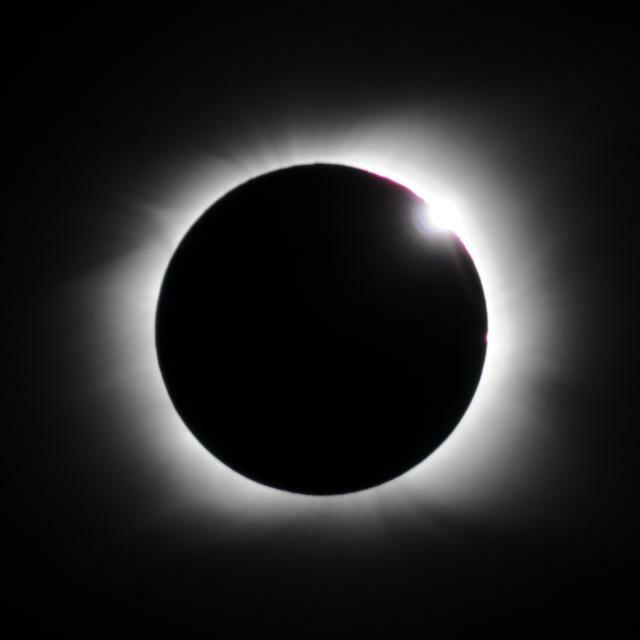 Eclipse photographers will sing your praises, and it should produce better material for high dynamic range images taken in less demanding circumstances. 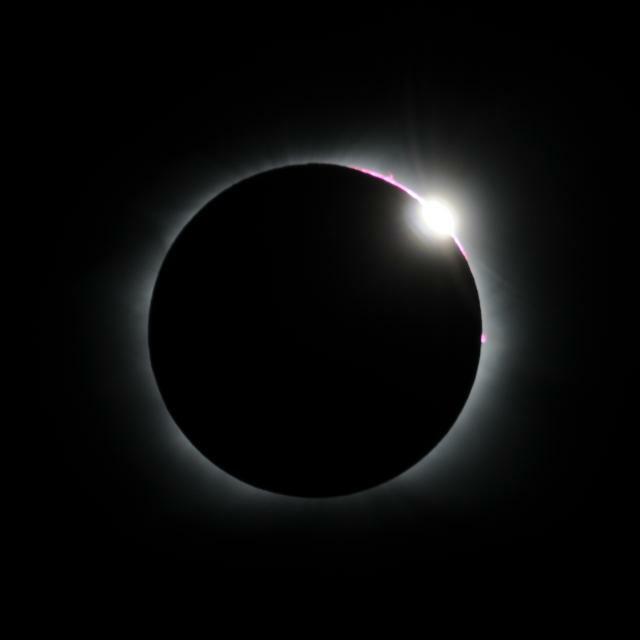 An instant later, the diamond on the ring has shrunk and the corona is coming out. Only instants before the photosphere is covered. 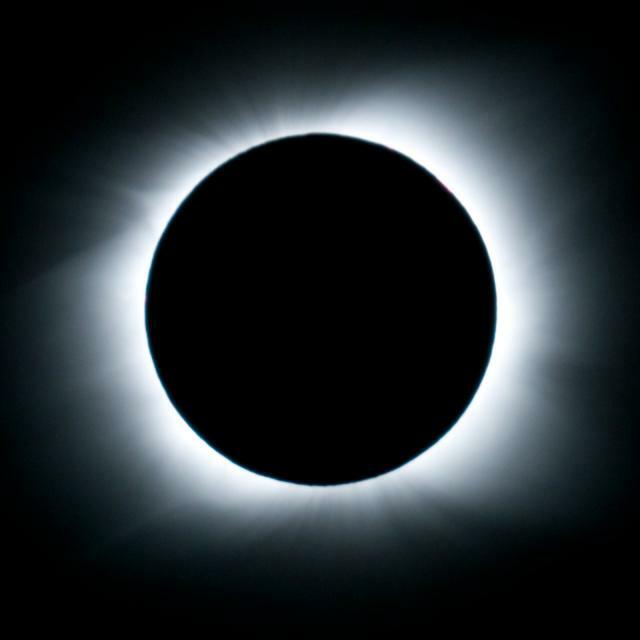 The corona is revealed in all its glory. Look at those polar brushes, characteristic of an eclipse of the quiet Sun. As totality enveloped us, Anakena was surrounded by the 360° twilight unique to a total eclipse of the Sun. 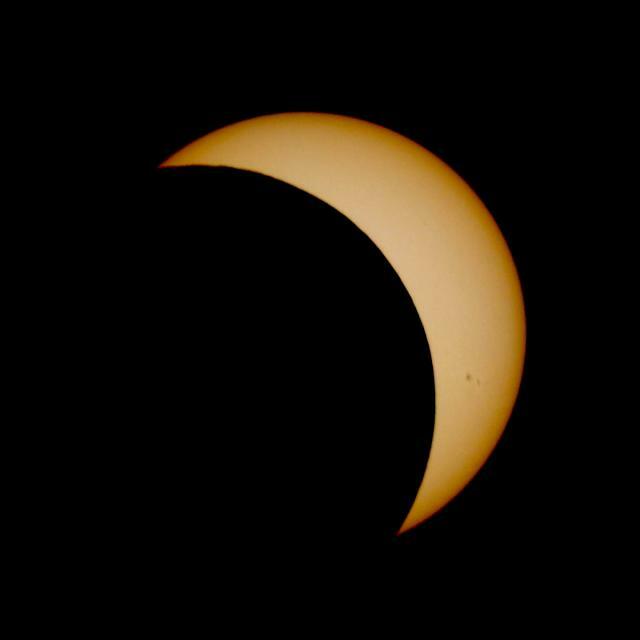 The eclipsed Sun is out of the frame at the top of this image. The lights in the foreground are idiots trying to illuminate the eclipsed sun with the flashes on their cameras. 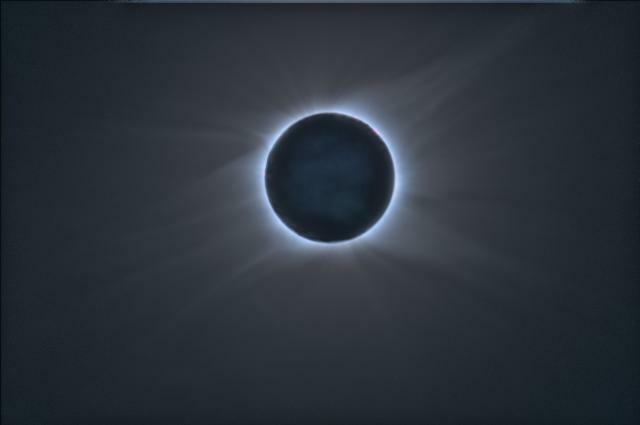 A longer exposure in mid-totality still captures the prominence at the 1 o'clock position and shows the polar brushes. Going longer still, we begin to see the streamers of the outer corona. And those streamers just go on and on! 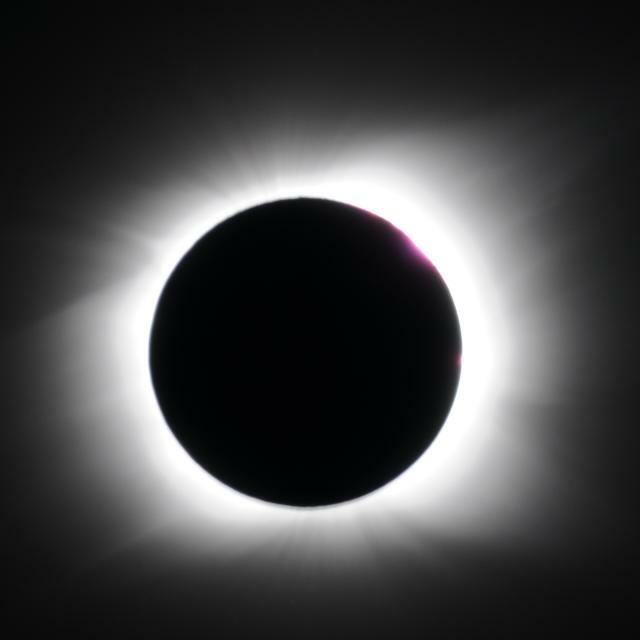 This 1/500 second shot at mid-totality shows prominences and inner corona. 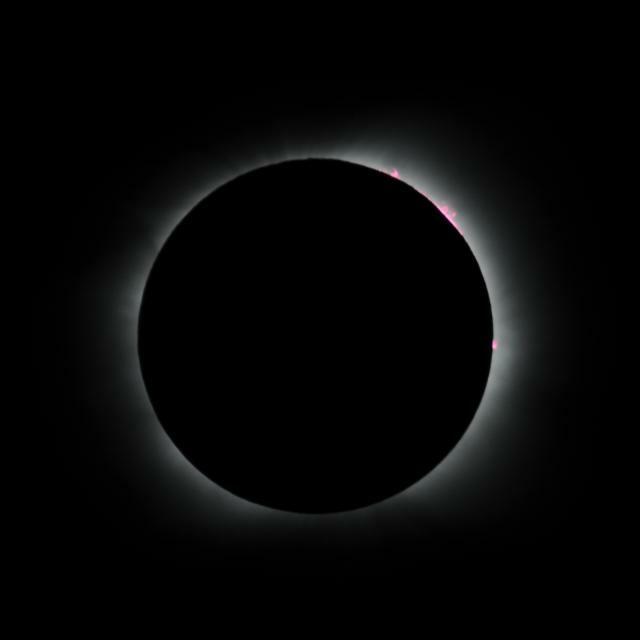 The chromosphere, evident in the photos just after second contact (the start of totality) is now covered, but the prominences on the right limb remain exposed. Look at that loop prominence at the 2 o'clock position! 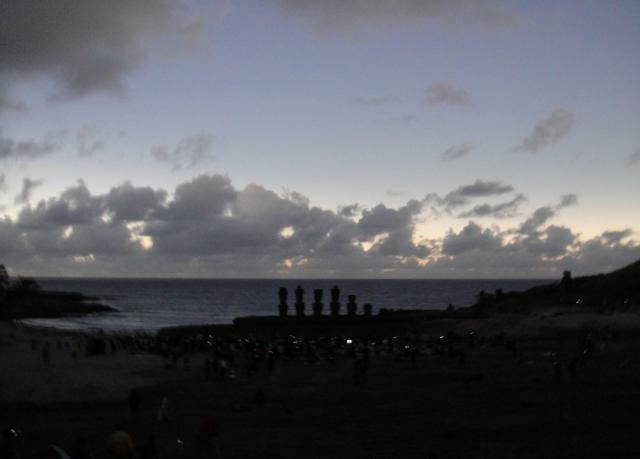 Taken at mid-totality, the eclipsed Sun is visible over the moai of Ahu Nau Nau, silhouetted against the sea. 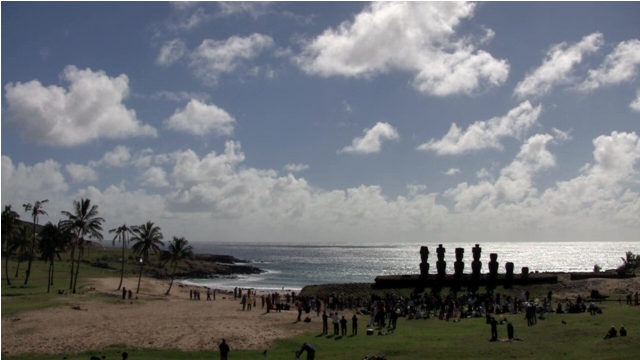 At the right stands Ahu Ature Huki with its lone moai. To the human eye, the sky was darker and the twilight shading around the horizon more prominent than in this 1/4 second exposure. A longer exposure (almost) washes out the prominences, but highlights the polar brushes. Stretching colour saturation, you can see the green hue of the forbidden line of oxygen in the corona. 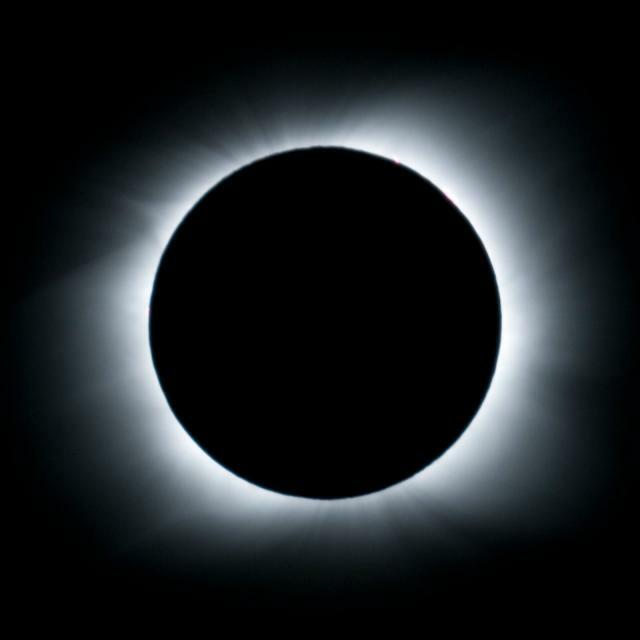 And an even longer exposure totally blows out the inner corona, but limns the extended streamers which become so obvious to the dark-adapted eye as the eclipse progresses. Now we enter the domain of special effects. 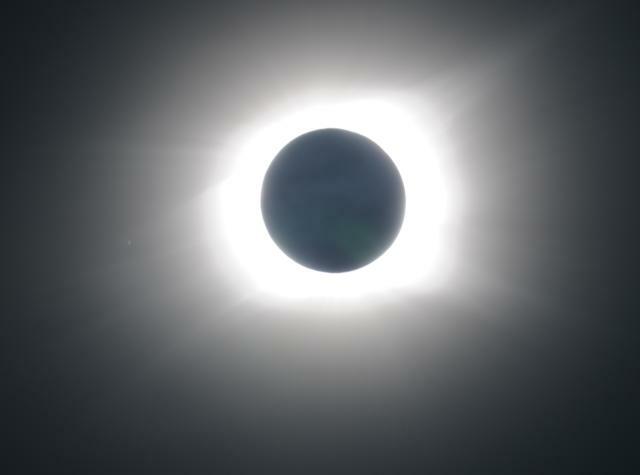 I've taken nine images from totality, photographed with exposures from 1/500 second to 2 seconds, manually aligned them, and assembled this high dynamic range composite image in an attempt to reproduce the visual impression of the eclipse. Bottom line: the prominences were more evident in the real thing, and the coronal streamers extended further than you can see them here. But this is much closer to what we saw in the sky than any single photographic image. Note that subtle detail of the lunar surface, illuminated by full Earthshine, is visible in this image. Toward the end of totality a cloud rolled in and obscured the Sun, more or less from instant to instant. 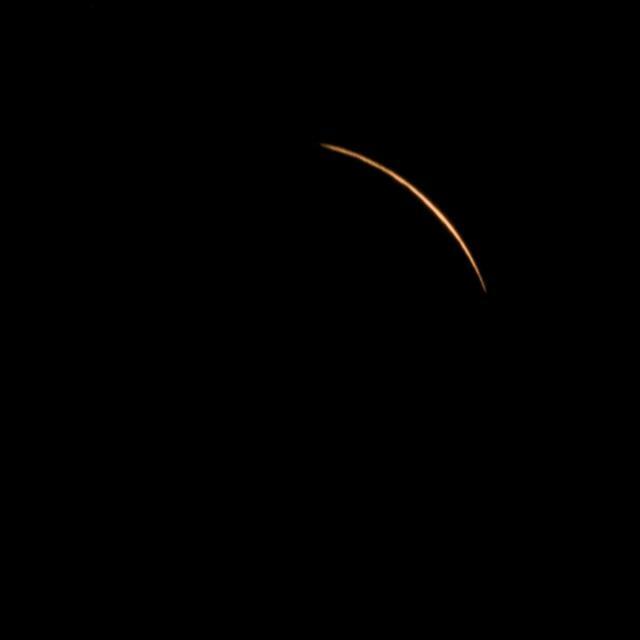 Here is an image through the cloud as prominences began to appear on the lower left limb of the Sun with the end of totality near. In the last moments before the end of totality, we see the chromosphere appear through the clouds. In less than a second, the photosphere would emerge and call an end to the magic of totality—at least until the next time in the shadow! 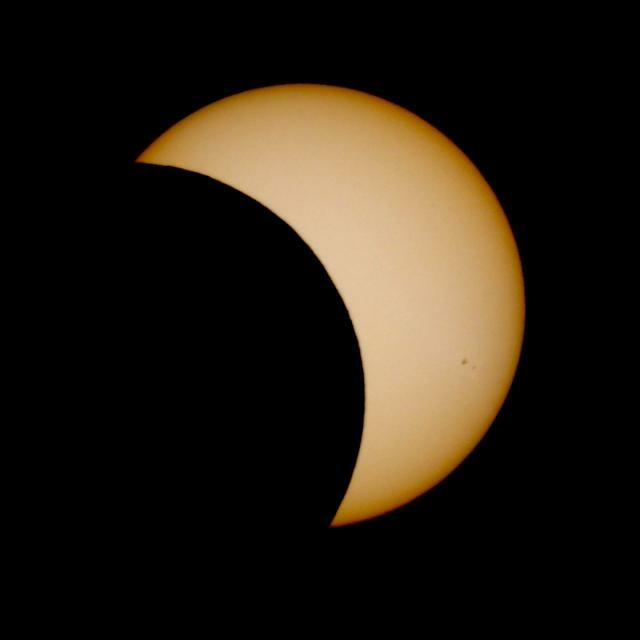 The following video shows the approach of the Moon's shadow and totality. 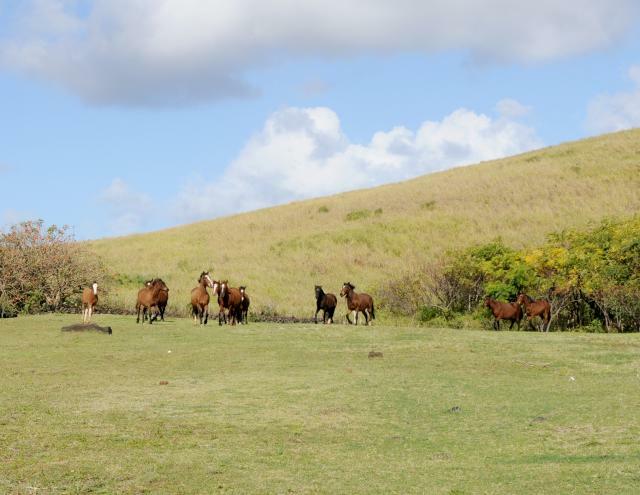 A herd of horses was deeply puzzled by the eclipse. 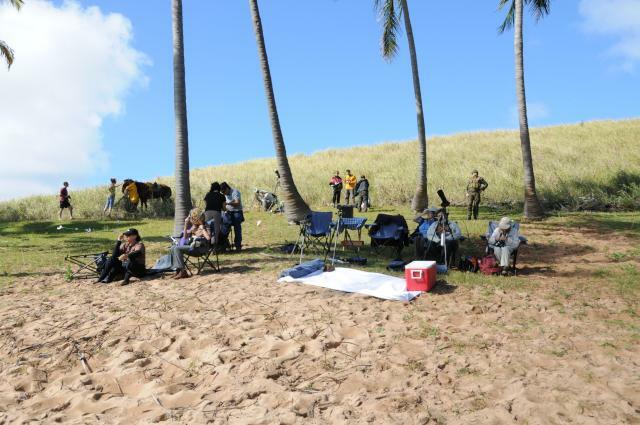 They stampeded, missing our tripods—thank goodness. Dang, I heard there's a stampede going on around here. 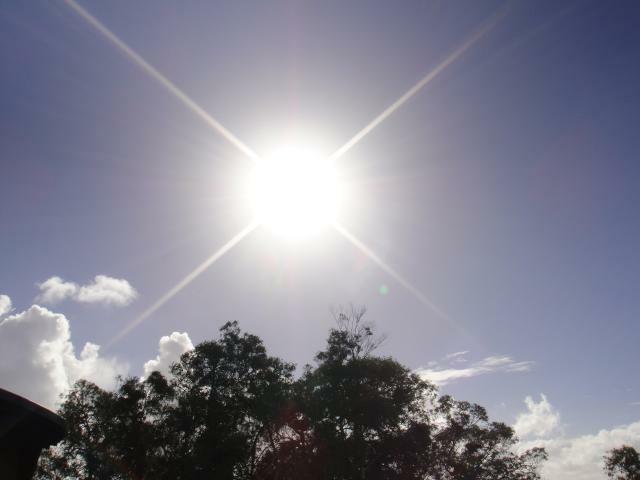 Something about a serpent eating the Sun. Anybody know where it is? I love stampedes.